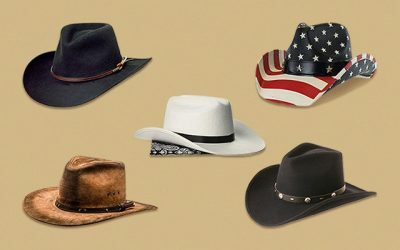 If you are a hat lover, you would already know that the cowboy hat is one of the most popular hats on the market with a rich heritage and history. You can learn more about this hat in this article here. 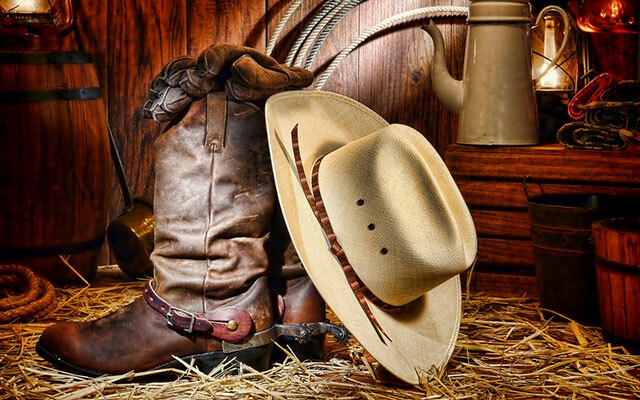 With its popularity, you can choose from various styles and design of cowboy hats. You can also choose from different materials and colors as well. One of the trendiest colors you can have with your cowboy hats is white. Like black, the white color goes well with other pieces of your clothes. In addition, it is elegant, subtle but powerful. Moreover, this color can be suited for both a formal and casual look. Still want to check out other colors, check out our collection for the best cowboy hats here. 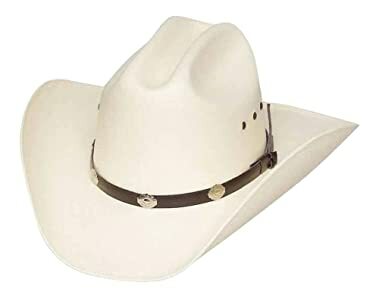 On the other hand, if you still want to buy a white cowboy hat, check out our guide below for some of the best white cowboy hats that you can find on the market. Its Main Features: The material of this hat is 100 % of paper straw. This hat features the classic Cattleman hat style with a leather hatband and 6 ventilation eyelets on both sides of the hat. On the hatband, there are various metal stud accents. This hat is available in both black and white cowboy hat. There are various sizes for you to choose from. There are many things that you would love about this cowboy hat besides its classic yet modern look. First of all, this hat is made of the premium material which makes the hat lightweight and comfortable to wear. It is also woven loosely enough to provide breathability to the hat. And thanks to the ventilation eyelets on both sides of the crown, your head will feel cool and dry all of the time, even in the hottest summer days. It also has an inner sweatband which helps to wick moisture away and prevent the forehead from rubbing against the material of the hat. Not only do the hat and the sweatband is made of the premium quality, the leather hatband is also soft and smooth to the touch. It is also durable and weather resistant to look nice all of the time. Second of all, this hat is well made with an excellent craftsmanship. The metal studs are glued nicely on the hatband so that they stay secured on the band for a long time. 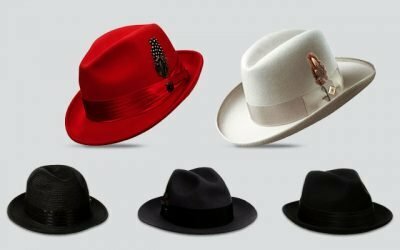 The construction of the hat is firm and solid so that the hat will not be deformed no matter how you take care of the hat. 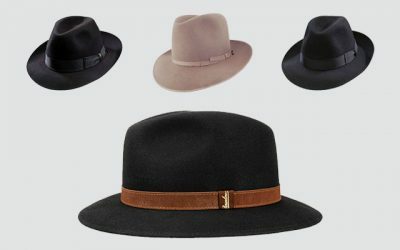 All of these features make this hat a worthy investment for your casual summer wardrobe. Its Main Features: This white hat is made of 100 % of wool felt material. 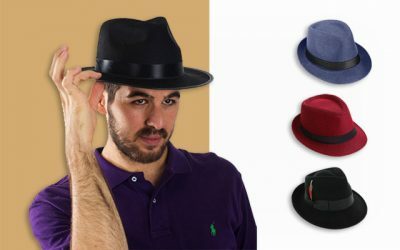 It features the classic fedora hat with crease crown and pre-curved brim. There are 2 bronze ventilation eyelets on both sides of the crown and a braided hatband. Besides white, you can choose from other colors such as black, brown, and coffee. This hat is available in 1 size that can fit head’s circumference of up to 23 inches. The width of the brim is 3.8 inches while the height of the crown is 4.3 inches. This hat is made of the premium wool felt material which is soft and smooth to the touch. In addition, it can keep your head warm and cozy when it gets cold outside. And don’t worry that this hat is too warm. With 4 ventilation eyelets, air can move freely around your head, keeping it cool and comfortable even when you have to wear this hat for a long time. The fabric is dust resistant so that even when the hat is solid white, it will not show off any dirtiness easily. The braided hatband can be used as the drawstring. You can use this nice feature in case there is a high wind coming at you. Moreover, while the brim of this hat is wide, it is reinforced so that it will not become flimsy when it is windy. 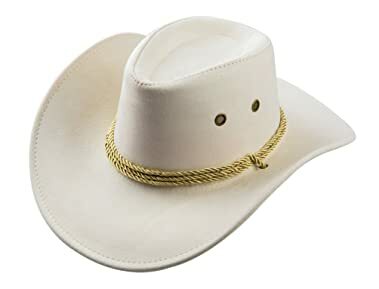 When you need a hat to wear when it is cool and windy, this is one of the best white cowboy hat options that you can have on the market. In case you are looking for a white felt cowboy hat to wear in all seasons throughout the year, check out this hat. It can be used for a night out or to formal events such as weddings and parties as well. 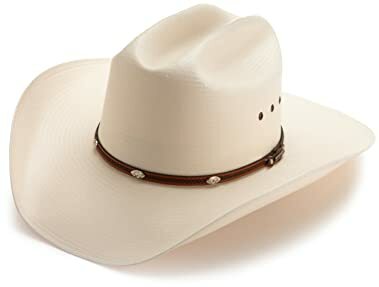 Its Main Features: This white cowboy hat is made of 100 % of canvas for felt finish. It has the design of an outback hat with a solid color. This hat is available in 1 size that can fit head’s circumferences of up to 24 inches. The height of the crown is 4 inches while the width of the brim is 3.5 inches. This hat is made of canvas, which might not be the most durable for a cowboy hat that you can find on the market. Still, it is processed nicely for a durable and long lasting finish. The fabric of this hat might be thick but the hat is still lightweight and you will not feel any burden even when you have to wear the hat for a long time. And with the mesh design all over the body of the hat, it is breathable and comfortable for you to wear the hat in the hottest summer days. However, keep in mind that these mesh body of the hat will not be able to protect your skin away from the harsh sun rays. This hat is available in 1 size with an elastic headband. This headband is super stretchy and elastic for you to have a comfortable fit with this hat. The hatband is soft and smooth which is also capable of wicking moisture away and making sure your forehead will not rub against the tough canvas material. The construction of this hat is rugged and durable as well. It is made with an excellent craftsmanship so that the finish of the hat is smooth, the body is sturdy, and you will not find any loose threads on the hat. Its Main Features: This Stetson hat is made of 100 % of natural straw. It features the timeless cutter design. There are 3 ventilation eyelets on each side of the crown along with a faux leather hatband and metal stub accents. The height of the crown is 4 inches and the width of the brim is 4 inches. This hat is from Stetson, one of the most reputational hat companies in America. Therefore, you can expect the hat to be of the premium quality with style and excellent craftsmanship. This hat is made of the natural straw for a soft and smooth touch. In addition, it is lightweight and breathable to keep your head cool and dry in the hot summer day. The leather hatband is also soft with a luxurious feel to the touch. Moreover, the metal stud accents are sharp and shiny, which is rust resistant to keep these detail look nice and clean regardless of how long you wear the hat. The brim of this hat is wide enough to provide a good shade for your face along with your ears and neck. 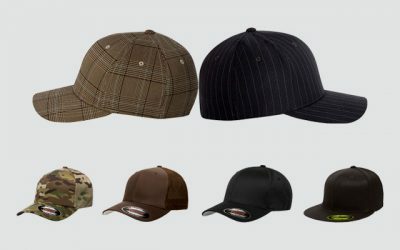 It is reinforced so that you can easily reshape the brim to create a style that you like. And it will not become flimsy in case of a high wind. The body, on the other hat, will not be deformed easily. 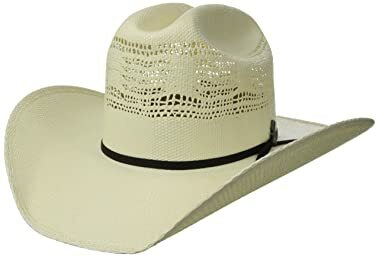 Provided that you are looking for a men’s white cowboy hat with a premium quality and style that you can wear for semi formal parities and occasions as well as informal events, this one is one of the best options that you can have on the market. 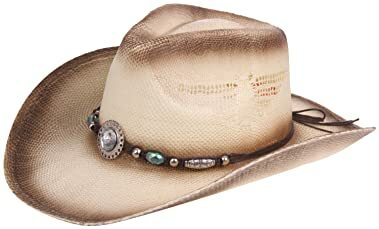 Its Main Features: This cowboy hat is made of 100 % of cotton featuring cotton and polyester. It features the classic cowboy hat design with a black and white cow print design. This hat is available in 1 size which can fit head’s circumferences of up to 24 inches. This hat is soft and lightweight as it is made of the premium cotton material. It also brings a soft body to the hat, making it easier for you to crush and fold the hat. When you take the hat out, it will easily spring back to its original form. Still, there are some crease and wrinkles that might appear on the hat. Nevertheless, you can easily steam or iron the hat to make the fabric flat again. 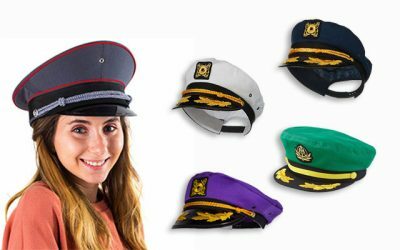 Moreover, while the hat is available in 1 size, it comes with an elastic hatband for the hat to easily adjust to your head’s size for a snug and comfortable fit. Moreover, the hatband help to wick moisture away and keep your head cool and dry all of the time. This hat might not be as durable as other white cowboy hats you see on the list. It serves the purpose of a costume hat. That is why you can expect the prints on the hat to be sharp and vivid for a strong visual effect. 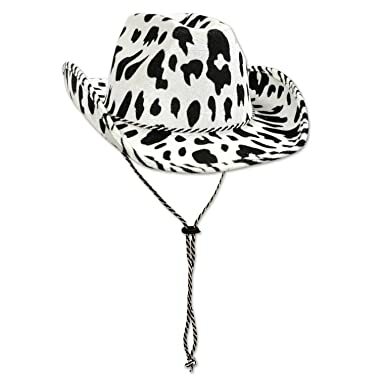 This black and white cowboy hat would make a great headwear accessory for a Western themed party. Its unique pattern is hardly found and it will surely make a fun accessory to have in your hat collection. Its Main Features: This white cowboy hat is made of 100 % of synthetic straw. It comes with a braided headband with a metal pin. Besides white, you can choose from other choices of colors as well such as dark navy and black. 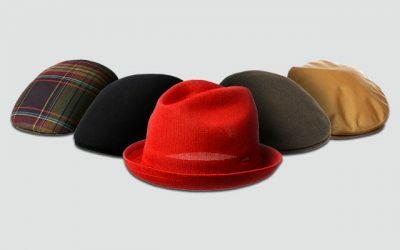 This hat is available in 1 size which can fit head’s circumference of up to 24 inches. The width of the brim is 4 inches while the height of the crown is 4 inches. The high quality synthetic straw is lightweight and breathable. It is quite tough and rugged though. However, it will not make you feel irritated, especially on your forehead thanks to the satin line. The hat is lined with satin to prevent your forehead from rubbing against the body of the hat. In addition, it can prevent hat hair quite well and keep your head cool and dry all of the time. Also, with the ventilating area around the crown of the hat, air can flow freely and you will not feel suffocated even when you have to wear this hat for a long time. This hat is made with an excellent craftsmanship so that the construction of this hat is firm and solid. The headband is braided nicely and firmly with no loose threads. The brim is not shapeable as it is quite stiff. However, thanks to the stiff body, the brim will not become flimsy and block your view in case of a high wind. 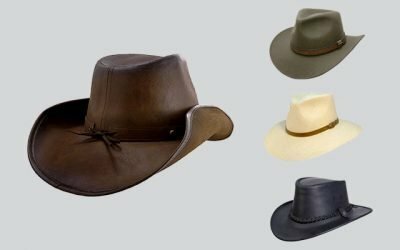 Provided that you are looking for a cowboy hat with the unisex style that you can wear for various informal occasions, you can consider this option. Its Main Features: The material of this hat is 100 % synthetic straw. This hat comes with a twine hatband as well as metal buckle and bead accent on the hatband. The hatband is made of faux leather. It has the design of a pinch front cowboy hat with a crease crown and a flat brim. It is available in 1 size that can fit head’s circumferences of up to 23 inches. While the floppy design of this hat can bring an elegant look to a lady, the brim can become flimsy and block your view in case of a high wind. Still, the brim of this hat is wide enough to cover your face as well as your ears and neck away from the harsh sun rays. While the hat is available in 1 size, it comes with an adjustable inner sweatband to provide you a snug and comfortable fit with this hat. Not to mention that this hat is made of the premium quality and this makes the hat lightweight and comfortable to wear. It is water resistant for you to wear under the light rain. Also, the construction of the hat is quite solid with nice stitching lines. The twine hatband is braided nicely with no loose threads. You can wear this white cowboy hat to a wide range of occasions- from music concerts, Western themed parties, to a holiday by the beach. If you are looking for a cowboy hat with a classic design and a modern twist, you will love the beaded details and the oval shape accent that this hat offers you. 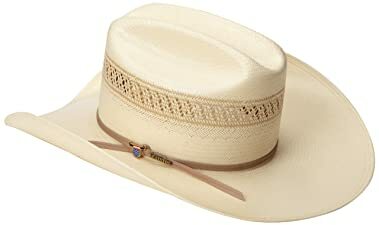 Its Main Features: This mens white cowboy hat is made of 100 % of Bangora straw. The height of the crown is 4.5 inches and the width of the brim is 4 inches. This hat has the stockman crown, a wide brim, and a 2 ply band with the Bailey insignia for a classic Western motif cowboy hat. It is available in Ivory. It has the sizes ranging from 6 ¾ to 7 5/8. The material which is used to make this hat is one of the toughest and most durable straw materials that you can find on the market. Moreover, the straw of this hat is woven loosely enough to provide you with good air ventilation. It is also quite tightly woven to help block the harmful elements of the sun rays and prevent your sensitive skin from getting sunburn. Another great thing about this hat is that it comes with an inner sweatband which is capable of wicking moisture away. The sweatband is also quite elastic to help you have a snug and comfortable fit with the hat. The brim of this hat is soft yet stiff enough for you to easily reshape the brim to whichever style that you like. 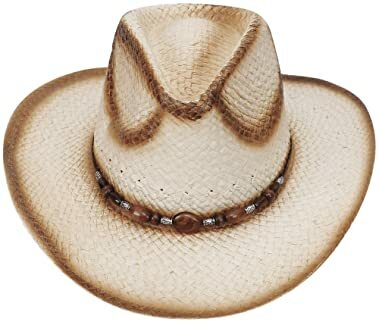 The minor problem that you might have with this hat is that this hat might run a little bit smaller than other cowboy hats of the same size that you can find on the market. You might consider ordering ½ size up with this hat. Its Main Features: This white cowboy hat is made of 100 % of synthetic straw. 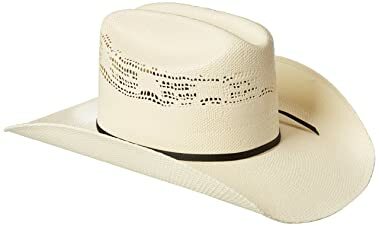 It features the natural white color in the classic Western pinch front cowboy hat style. The details on the hat include 100 % of genuine leather sweatband, an iconic Twister pin and a 2-cord ribbon. The width of the brim is 4 inches while the height of the crown is 4.5 inches. It is available in various sizes from size 6 to 7 ¾. 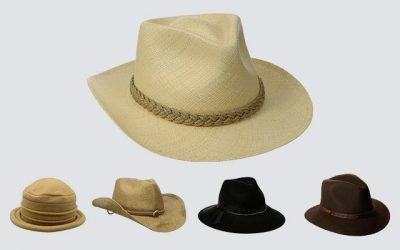 Like other high quality white cowboy hats which are made from synthetic straw, this hat is super lightweight. It might not be as smooth as the cowboy hats made from natural straw but still smooth and breathable. Moreover, this hat is water resistant to keep rain out of the face. The sweatband of this hat is made of 100 % of thin vinyl which prevents your forehead from rubbing against the hat and help wick moisture away. Moreover, with the venting design around the crown of the hat, your head will feel cool and comfortable when wearing this hat for a long time. The brim of this hat is so wide that it can provide a large coverage for your face and your ears. It is also reinforced that you can easily shape the brim of this white cowboy hat to whichever style that you like. Overall, the construction is rugged and durable and the hat will stay in its shape for a long time. You can choose to wear this hat for a themed party or a casual event. Its Main Features: This white cowboy hat is made of 100 % of 10x natural straw. It features the mesh pattern on the crown of the hat and a ribbon leather hat band as well as a 2-ply tan band with an ustrc pin. The design of this hat is the classic cattleman style. The width of the brim is 4.5 inches while the height of the crown is 4.5 inches. This hat is mad of the premium straw material. The straw is all natural and processed nicely so that the hat is lightweight and comfortable to wear. It is also durable and resistant against fading. Moreover, thanks to the venting all around the crown of the hat, air can flow freely around your head, keeping it cool and dry. The sweatband of this hat is made of the Dri-lex material. This material makes the hatband thin and breathable. In addition, it helps to wick moisture away and prevent odor from developing effectively. 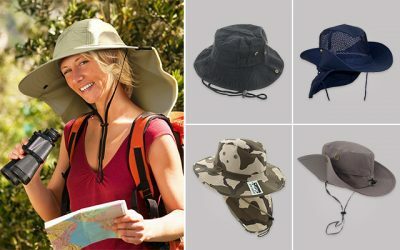 The hat is soft and smooth so that you can easily fold the hat and pack it into a small bag for easy storage and carrying around. Another thing that I love about this hat is that the brim of this hat is slightly wider than the brim of the hats that you can find on the market. With such a wide brim, the hat can offer a large coverage for your face as well as your ears and neck from the harmful sunrays. 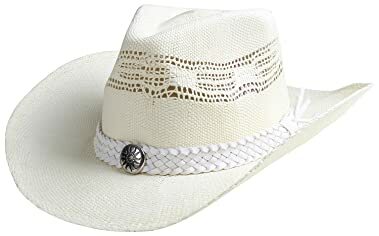 The small minor problem with this hat is that it is slightly more expensive than other white straw hats that you can find on the market. Still, if you are looking for a premium hat which can last through many years of wearing, this hat is worth your investment. 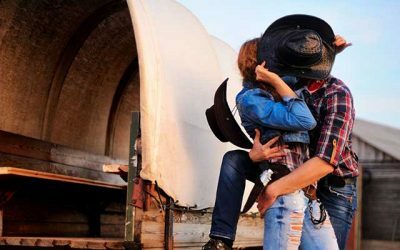 That is all about the feature, pros and cons of white cowboy hats which are the most stylish and high quality white cowboy hats that you can find on the market. They can be made from various types of materials including straw, cotton and wool felt. They also have different features, designs, and shades of white as well. 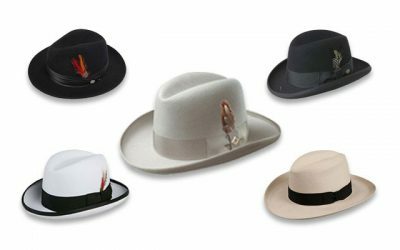 But there is one thing for sure; they are made with the great craftsmanship for your utmost comfort while wearing the hat. I hope you can quickly find the best white cowboy hat to add to your hat collection from the list we have carefully selected above.